This blog is articles, videos and infographics relating to the work of a locksmith in Glasgow. This what your Liberty Locksmiths Blog Blog Ad will look like to visitors! Of course you will want to use keywords and ad targeting to get the most out of your ad campaign! So purchase an ad space today before there all gone! Are you living with locks that don’t really work properly? Maybe you’re finding it a struggle to open or close your doors when you leave the house or after you come home from a busy day. Alternatively you might be looking for a way to beef up your home security by installing new and improved locks. We talk to a lot of people who’ve been told that they’re stuck with the locks they have. Either that or they need to think about replacing their whole door. The good news is that it doesn’t have to be that way. If you think your locks are beyond help, there could still be a solution. Why couldn’t my lock be repaired? There are lots of potential reasons why your locks can’t be repaired. Depending on the design there may be a problem with the whole lock, for instance if some of the internal mechanism has warped or corroded over time. Locks are designed to be secure. Sometimes that means that they’re designed to join together seamlessly. It isn’t always possible to remove a single part and replace it. If you’ve had a locksmith tell you that they can’t do anything with your locks it could be because of an issue like this. Sometimes it’s for other reasons. We carry lots of different parts and locks so that we can carry out repairs on the spot. We offer an emergency call out service which often means we need to do a quick repair or replacement. Sometimes we come across a lock that’s a bit unusual. The parts aren’t always available straight away so we need to order them in. We’ve heard that some locksmiths don’t do this. That’s up to them but it doesn’t help you to find a solution. Why is it difficult to replace existing locks? If you’ve got a standard Yale type lock it’s really easy to replace. However, it can be harder to replace locks in modern double glazed doors. The locks are often embedded into the structure of the door as part of the manufacturing process. It’s still possible to replace them, it just takes a bit more work. You also need to have the right knowledge and training. We try and keep up to date with new designs so that we can solve any problems straight away. It’s quite common for people to want to change the locks when they move into a new house. You might also want to replace your locks if a key has gone missing or if you want to improve security overall. We make sure that we keep our training up to date so that we can help with those issues. If you are having problems with your door locks then please keep Liberty Locksmith on your contacts list. We consider ourselves to be the cheapest professional locksmith in Glasgow and surrounding areas who won’t disappear if a fault arises from any repairs we do. We genuinely offer a full 12 months parts and labour guarantee no quibble. The post Are Your Locks Beyond Help? appeared first on Emergency Locksmith Glasgow - Liberty Locksmiths. The post Faulty uPVC Door? Liberty Locksmith’s Free Gain Entry Service appeared first on Emergency Locksmith Glasgow - Liberty Locksmiths. The post Replacement Yale SBD Multi-Point Lock appeared first on Emergency Locksmith Glasgow - Liberty Locksmiths. It’s the time of year when you have to start thinking about Christmas shopping and those festive celebrations, as well as all of your normal day to day tasks. You might have to fit in a trip to the shops before the school run. There might not even be time to go home before your work do. All these changes to your routine mean that it’s easier to make mistakes. You put on a different coat or pick up your evening bag for a night out. Then when you get home late you realise that your keys are in the pocket that’s on the other side of your front door. Even worse, you might return to find that you’ve been the victim of a burglary. Will you need a locksmith this Christmas? Here are our tips for steps to take if you’re faced with an emergency. If you’ve arrived home to find yourself locked out because your keys are missing it can come as a bit of a shock. The important thing to remember is that there is always a solution. Firstly, think about where there might be a spare key. We don’t recommend leaving spares under a flowerpot but is there someone else who could let you in? Depending on the time of day you may be able to call on a friend or family member who has a spare key. Of course, your keys might not be missing. We’ve been called out to people who let themselves into the house then returned to the car to bring more shopping in. The door slams behind them with their keys on the inside. What if it’s a break in? Being broken into is an awful feeling, especially at Christmas. If this happens to you your first step should always be to call the police. They’ll want to examine your home to see what evidence they can find. Burglars can get into your property in a few different ways. They may have caused damage to your locks or UPVC doors to gain access. Whatever the damage you’ll want to make sure that your home is made secure as quickly as possible. That’s where a specialist locksmith can help. We offer a 24 hour service and can replace locks and even repair UPVC doors whenever you need us to. Burglaries can be particularly common around Christmas when burglars know there’ll be gifts in the house. We can come and check your locks to make sure they’re up to the job to give you peace of mind. There are lots of locksmiths advertising online. We’d always recommend choosing someone local. They can get to you quickly because they’re nearby. They’re also more likely to know the area so you won’t have to take phone calls from a locksmith who can’t find your house when you just want to get in out of the cold. Within our area, we know that we can usually get to any call out within 30 minutes. Sometimes it isn’t even that long. A local company will also usually have local staff. You won’t be put through to a national call centre. The person who answers the phone will be just down the road. In our case, Denis takes all the calls. He’s a qualified locksmith so he can give you the best advice straight away. Will you need a locksmith this Christmas? Visit our contact page to save our number – just in case. The post Will You Need a Locksmith This Christmas? appeared first on Emergency Locksmith Glasgow - Liberty Locksmiths. The post Replacing a Multi-Point Door Lock in Cumbernauld appeared first on Emergency Locksmith Glasgow - Liberty Locksmiths. The post How to Gain Entry to a Brisant Ultion 3 Star Cylinder Lock appeared first on Emergency Locksmith Glasgow - Liberty Locksmiths. 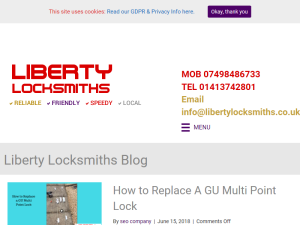 If you are the owner of Liberty Locksmiths Blog, or someone who enjoys this blog why not upgrade it to a Featured Listing or Permanent Listing?